If you like pumpkin pie, but are looking for something a bit richer and more flavorful, Squash Pie is the pie for you. I used heirloom hubbard squash to make this hundred-year-old Squash Pie recipe, but other winter squash would work equally well. This recipe uses less milk and more eggs than the typical modern pumpkin pie recipe. Similarly the spices are just a little different from modern recipes. Many modern recipes call for cinnamon, nutmeg, and ginger – the old recipe lists cinnamon and nutmeg, but does not call for any ginger. All of these tweaks are good – but the texture and taste are a little different than modern Pumpkin Pies. Preheat 425° F. Put pureed squash in mixing bowl, add sugar, eggs, milk, salt, cinnamon, and nutmeg; beat until smooth. Pour into prepared pie shell. Place in oven. Bake for 15 minutes, then reduce heat to 350°. Continue baking (approximately 40-50 minutes) until a knife inserted in the center of the pie comes out clean. Posted on November 19, 2017 November 18, 2017 by SherylPosted in FoodTagged pie, recipe, squash. This sounds outstanding, Sheryl. One recipe ready for the printer – thanks! This really does seem like a special part of your culture. I haven’t come across anyone in England – and that includes me – who fancies sweetened pumpkin. Should we try this one? hmm. . . this recipe also includes sugar, so maybe not. The warm, spicy, nuttiness of the nutmeg is a somewhat more dominant flavor in this recipe than in many more modern ones; and the custard is a little “eggier” (in a good way). My first thought was ‘what’s chopped paste?’ so thanks for explaining that one! Makes me want to look up a recipe for that. Pie looks lovely, and perfect for this time of year. I’m going to have to make the “chopped paste” recipe sometime and then post it. It calls for using both butter and lard to make the pie pastry. Confession – I was going to make it when I made the squash pie, but then I realized that I didn’t have any lard so I instead used my more modern “tried and true” pastry recipe. This pic looks exactly like my mom’s recipe for pumpkin pie which is more like a custard instead of a sweet potato texture of many pumpkin pies. This pie has a nice old-fashioned taste to it. My husband actually told me today that he likes it better than the pumpkin pie recipe that I usually use. That said, I’m not sure whether this pie is the same as your mom’s. It calls more less milk than most modern recipes, so there is relatively more squash and egg. My mother’s recipe has twice as much pumpkin as milk, and two eggs per pie. but she used to boil the pumpkin to cook it so it was very moist as well. The pumpkin mixture was very “pourable.” She also made her own pie crust which was wonderful! Your additional description of your mother’s pie is starting to make me think that you’re right, this pie may be similar to her pie. I boiled the squash. The old recipe calls for “stewing” it. I cut the squash into 1-inch cubes, covered it with water, and then boiled until tender. This recipe also has a relatively high amount of squash to milk. Looks yummy. You’re getting me in the mood for my Thanksgiving dessert! My grandmother makes squash pie instead of pumpkin pie. I don’t know if she uses this exact recipe, but squash pie in general is quite delicious. Squash makes a nice pie. 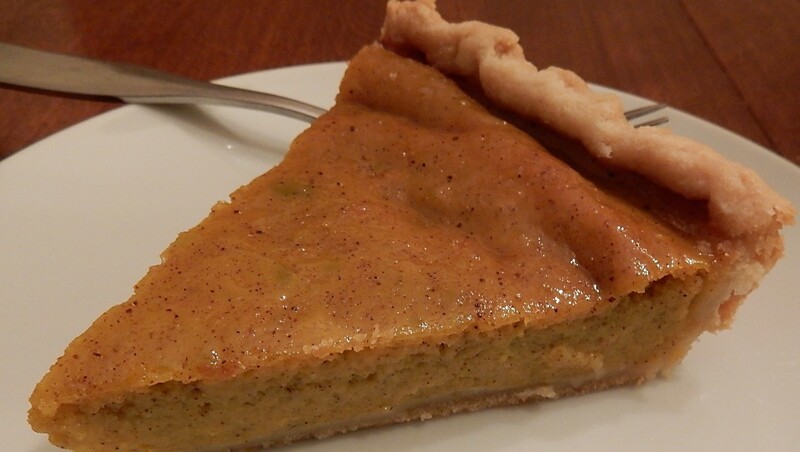 Over the years I’ve often substituted squash for pumpkin in pumpkin pie recipes. It’s nice to have found a recipe written especially for squash. I wonder how the nutrition of squash pie compares with pumpkin . . . .
Not sure. . . Given the orange color of the flesh of both pumpkin and squash, I’d guess that both are high in vitamin A.
I just looked it up. Squash has a lot more vitamin A than pumpkin. In general, it looks a bit more nutritious. I kind of thought it might be so, which is why I always liked pumpkin best–more like candy. But I need to try your pie! I love pie but I’ve never been able to make a successful piecrust look good. I appreciate seeing your success. I think this year I’m going to be making the stuffing and the cranberry sauce. Nice to share with the family in the preparations. mmm. . . You’re making some of my favorite Thanksgiving dishes. My mother-in-law knew how to make pies with perfectly crimped edges. I try my best, but my pie crusts aresn’t even in the same league as hers. I’ve also heard that canned “pumpkin” is really squash. If this is true, it almost seems like a case of false labeling. Have a wonderful Thanksgiving! This recipe sounds worth a try! And, I hope that you have a wonderful Thanksgiving! This recipe makes a very nice pie. Our family’s Thanksgiving preference for years. My mother started using butternut squash when she couldn’t find long-neck pumpkins. Now, I’m curious. . . I’m not familiar with long-neck pumpkins. What do they look like?